If you’re discouraged by a small closet, take heart: There are plenty of ways to make your space more streamlined and organized—and even make it seem bigger. With the right organizing products, a few decorating tricks, and a little patience, you might find that tiny closet is actually just right. (Major bonus: these ideas won’t cost a fortune.) Here, three experts open the doors. After tossing the pieces you no longer wear or haven’t used in a year—and the ones that long ago went out of style—zero in on the clothes that are too tight. “People think hanging on to smaller sizes will inspire them to lose weight, but you can only wear the size that fits you right now—you never change a size overnight,” says Julie Morgenstern, a professional organizer and author of Organizing from the Inside Out. If you have diet plans, store your tighter clothes elsewhere and put them back after you reach your goals—the act of swapping out larger sizes for smaller ones might even make you feel more accomplished. To help you store those aspirational pieces of clothing you’ll soon be wearing pick up a few durable storage containers like the MISSLO Oxford three-piece set. The set’s durable design, with metal zipper and airtight closures, means no dust, dirt, or mold can enter while your goods are stored. And, the set’s fabric designs means you can collapse them when you’re done using them. And yes, that may mean more than clothes, shoes, and accessories. “Remove those plastic coverings that come with your dry cleaning,” says Lisa Zaslow, an organization and productivity expert and owner of Gotham Organizers. “They actually don’t protect your clothes because they trap the dry cleaning chemicals. 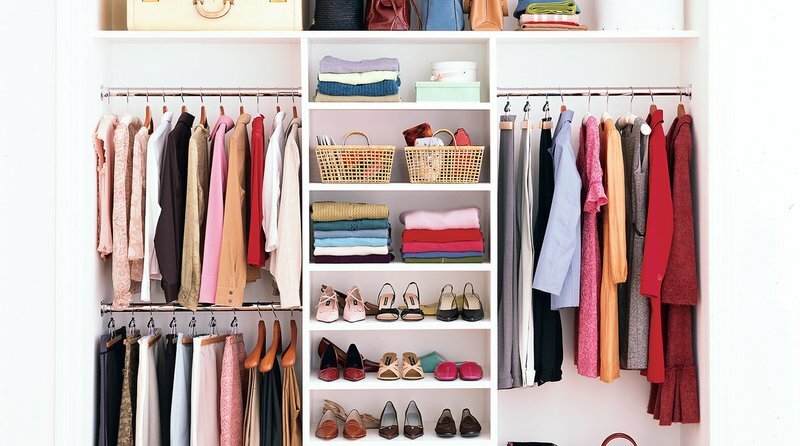 It’s also shocking how much space they take up.” Since you want to maximize every last bit of space, opt for thinner hangers and remove excessive amounts of empty ones, while leaving just a handful in one spot so they’re easy to find and use. You might be tempted to try stacking or “cascading” hangers, but they can be hard to maintain. Before you invest in this type of product, make sure you can easily grab clothes from them. For the best bang for your buck, order a set of 50 hangers from Amazon. Though they are part of the “basics” collection they are anything but, as the hangers are made from no-slip velvet material to keep all your garments safely in place. And their ultra-thin design means you can hang even more clothing inside a wardrobe. Once you can see your closet floor, treat yourself to a Birdrock three-tiered bamboo shoe rack. The rack is not only environmentally-friendly but can also hold up to 12 pairs of shoes. And thanks to its compact design, it can fit in just about any closet you’ve got. If looking into your closet is like staring into the abyss, illuminate it. “Just having more light in the closet will make it seem bigger,” says Zaslow. Swap out your normal rod for an LED closet rod, which is motion activated and battery-operated. Or, for an even easier and economical fix, purchase a set of Dewenwils Wireless LED lights, which simply stick onto walls and other surfaces. And, as an added bonus, the lights also come with a remote control, a timer, and a dimmer feature, meaning you’ll never get lost in the dark. Once you’ve divided the top shelf, buy a few Aobeau linen folding closet storage bins to fill the space. The bin’s rope handle provides easy access to your goodies, and the rich brown color will give your closet a new, sophisticated and organized look. But, don’t go for just any old mirror. Instead, up the ante with a NEX LED wall-mounted jewelry armoire that has a full-length mirror to boot. This way, you can simply hang the mirror over your closet door, but also have the added bonus of a lockable jewelry storage unit to boot. A fresh coat of paint is an inexpensive way to add the illusion of space. “I’d get a durable paint, such as one with a satin or gloss finish, because the walls will get some wear and tear from clothes and shoes,” says Zaslow. “A light color—like white, light yellow, or pale pink—can make everything seem cleaner and brighter.” Brighter hues can also make a tiny spot seem more open and airy. If you’re totally adverse to painting or are afraid to commit to a color, try a peel and stick wallpaper like Roommates’ polka dot design instead. This way, you can test out a new look without having to live with it forever and can change it up as often as you’d like. For an easy corner shelving solution, look no further than Rubbermaid’s FreeSlide wire shelving. It’s simple to install and will keep your stuff in place until you’re ready to use it. You can even hang clothing from its bottom hooks, too.